These are my automatic investments for the last week of December. Not much excitement here as most of the stocks I wish to own are setting record highs so I just added to my high yielders. Out of these five I consider T, VZ, and PM to be attractively valued. CVX isn't meeting my <$100 mark so I didn't add. I wish to add XOM if it hits $85. Seems like oil has risen sharply recently. Hopefully the oil prices will fall further so I can scoop up more. These will be bought some time on Tuesday afternoon. The annual dividend added is estimated to be around $21-22. I found a new chart option in Google docs that allows one to display Treemaps. Below is a picture of the treemap for my current holdings. 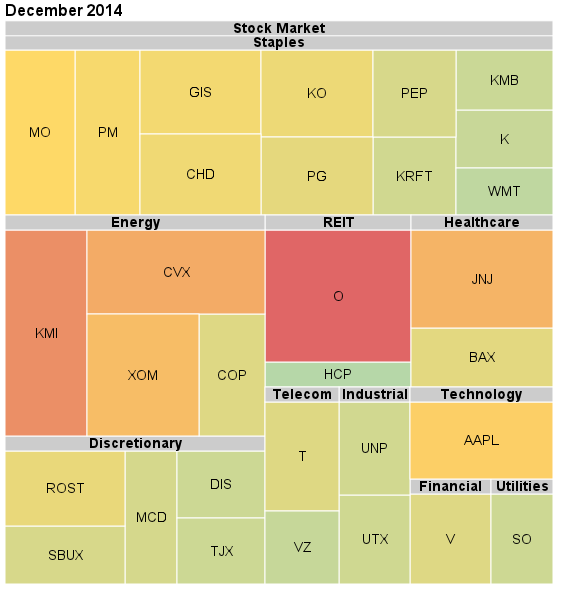 I think it's a a cool nifty way of quickly seeing what your sector and stock allocation is. I am clearly heavy in consumer staples. My largest stocks are O, KMI, and CVX. My watchlist for next week include several stocks in addition to the usual energy names CVX / XOM / KMI. EPD is also looking attractive. Although BP and RDS.A offer higher yields I prefer to stick to quality American. BBL is also cheap, but I decided that BBL is not that type of industry I am comfortable in partnering in. My weekly Tuesday investments are as follows. Bought cheap, quality, and high yield. Plain and simple. Core position additions. November was a great time for stocks. The S&P500 rose moderately. Stocks appear expensive and there appears to be PE expansion. The oil sector continues to get pulverized as OPEC continues oversupply. In November I received $121 of dividends. At the end of the November month, my portfolio sum had exceeded the $66,700 goal I had placed myself this year. The sum of the 401k and dividend portfolio is around $69000 and yields $1880 in dividends a year. I will not be able to hit $2300 in annual dividends (3.5% yield) by the end of this year because my portfolio includes Vanguard indexes (my 401K doesn't offer any higher dividend yield options!!). I will have to readjust the dividend yield goals next year to include the Vanguard index funds. 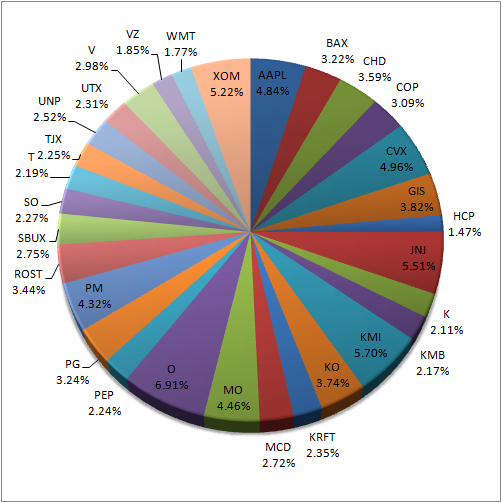 I am heavily weighted in O, KMI, JNJ and XOM. I have several low yield growth plays such as ROST, SBUX, TJX, UNP, and V. My high yielders with lower growth include T, HCP, O, PM, VZ, and SO. The aim of my portfolio was to try to have both high yielders with little growth and low yielders high growers. I have also moved my brokerage to Sharebuilder. I will be taking advantage of their monthly automatic investment program which offers 12 purchases for 12$ a month. This will help greatly compared to my old brokerage. I am also available to access Fidelity research reports now, which allows me to read reviews from S&P, Jefferson Research, and others. Sharebuilder also offers me reviews from Morningstar. I believe that these research articles will help in addition to my current stock resources. My plan for the coming month is to continue staying invested. There have been a lot of talks about market highs and possibility of a market correction. However, I am still in the very early accumulation phase and I think any drop in the market can be easily remedied by my continuous income contribution. The portfolio will eventually achieve equilibrium pricing after a market drop since the majority of my holdings are high quality; and the continuous contributions at lower market prices will aid in reducing the cost basis even further. I am intrigued by the cheap oil sector prices but am still patient in pulling the trigger. I have already bought CVX at $111 and XOM at $93 back in October. I want to wait even further before pulling the trigger on CVX. My target is $100 but can consider $103. I am not considering XOM at the moment. 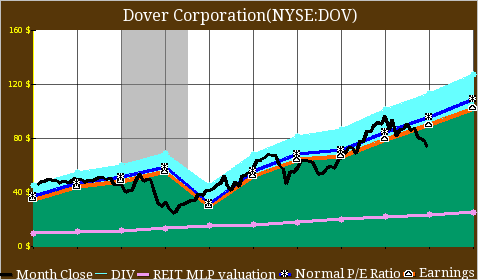 COP, RDS.A, BP are hesitant buys for me since I would rather much own CVX. Out of the 3 I would want COP most. 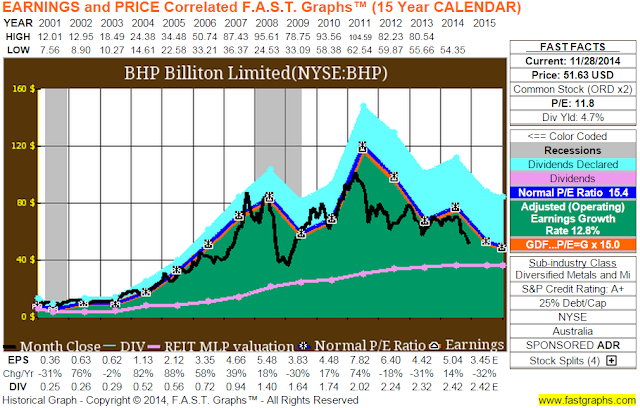 BP and RDS.A do not have impressive dividend histories to me. Shell and BP have much higher payout ratios than XOM and CVX. COP's payout ratio is in the middle. However, I may just consider dripping small amounts into BP and RDS.A in my automatic investment purchases since they are just oh so cheap and their yields so high. My buy target for COP is $60 (it probably won't reach there unless crude hits $50 a barrel). I am highly considering selling COP to buy other depressed oil stocks for tax harvesting this year (i.e. sell COP to buy CVX or BP and avoid paying capital taxes this year for my handful of profitable sells). 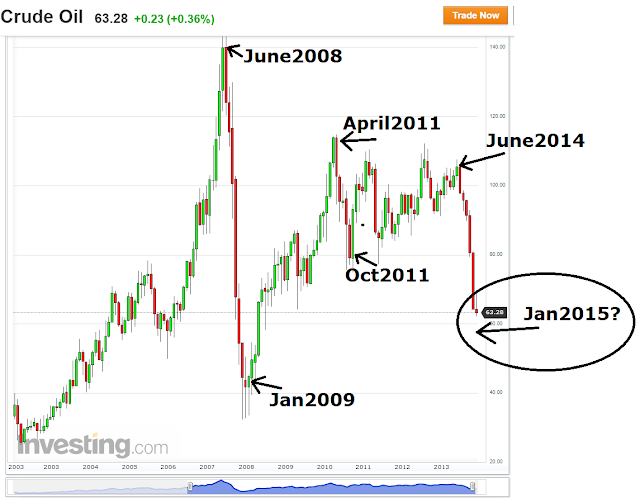 I am ignoring the drillers from my watchlist since I think they are too sensitive to oil prices. HP and SDRL and ESV have taken great hits recently. I am relieved that I was able to sell SDRL at good prices before the massive crash in prices. After my experiences with SDRL and ARCP, I am traumatized at high yielders and no longer trust them. 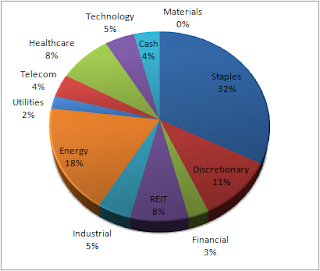 My "SWAN" category now prefers stocks in the 2-4% yield range with occassional stocks in the 5-6% (such as AT&T). BBL or BHP also has shown increased distress in prices and appears extremely cheap with a 5% yield (for BBL). The stock is attractively valued and I am highly considering dripping small amounts weekly. The stock is more volatile than I like but at this valuation and yield I think the risk is worth it. I believe T, GE, MCD, are fairly valued at the moment. AT&T appears cheap after the competitive pricing wars initiated by Sprint. I will consider adding to AT&T to provide more steady income. I do not feel like adding more to MCD and tend to avoid GE. In the technology side of things, I am considering IBM. The stock looks VERY cheap right now and they are very strong financially. I believe IBM can eventually overcome its slump like it has done in the past. Technology plays are risky since they have to reinvent themselves, as seen by IBM moving away from hardware into a software cloud service provider. My investment in APPLE has paid off handsomely this year, but it is an investment that I feel less comfortable than something like PG or KO. More possible buy may come in the weeks ahead.